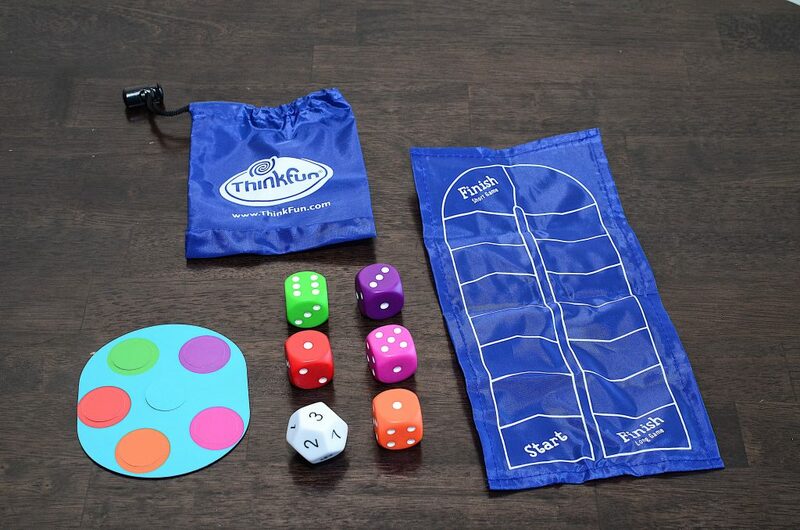 Math Dice Jr is a fun mental math game from ThinkFun Inc. 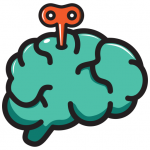 The game is recommended for ages 6 and up and is designed for 2 or more players. The game will help to build early math skills. Your kids will learn and further develop early math skills as they play. The object of the game is to be the first plater to reach the finish line. In order to reach the finish line a player must use addition and/or subtraction to reach the target number. To begin, each player choses a game token and places it at the start line on the scoring track (game board). Players take turns rolling the target die and the scoring dice. The youngest player goes first. The first player begins by rolling the target die. The number rolled is established as the target number. The same player then rolls the 5 scoring dice to establish the five scoring numbers. Example: The target number rolled is a “7”. The scoring numbers rolled are “2, 5, 3, 1, & 6”. The players now have to combine the scoring numbers using addition and/or subtraction to match the number “7” (the target number). 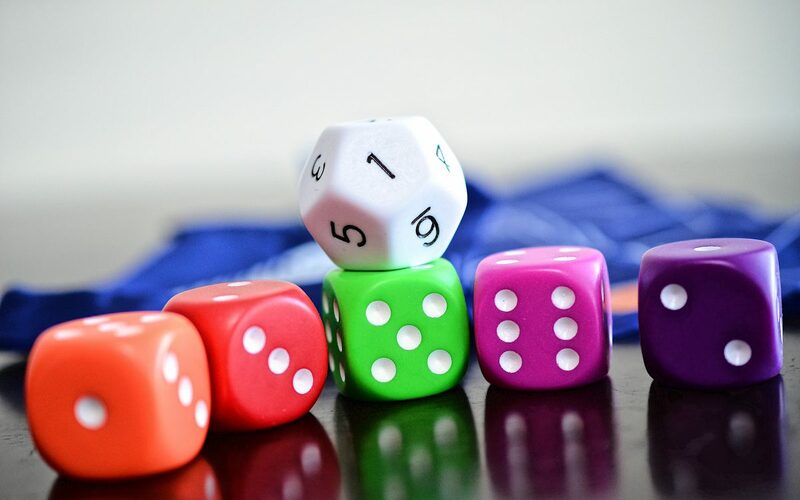 When a player sees a way to add or subtract scoring numbers to match the target number, they yell out, “Math Dice!” That player explains the calculation used to reach the target number. For example a player can reach the target number “7” by adding the scoring numbers “2” and “5”. (5+2=7). Players can use 1 scoring number or all of the scoring numbers. Players score one point for each scoring number used in their equation. The player moves their game token once for each point earned. In this example, the player would earn 2 points for using the scoring numbers “2” and “5”. The player keeps the scoring dice used for the round. 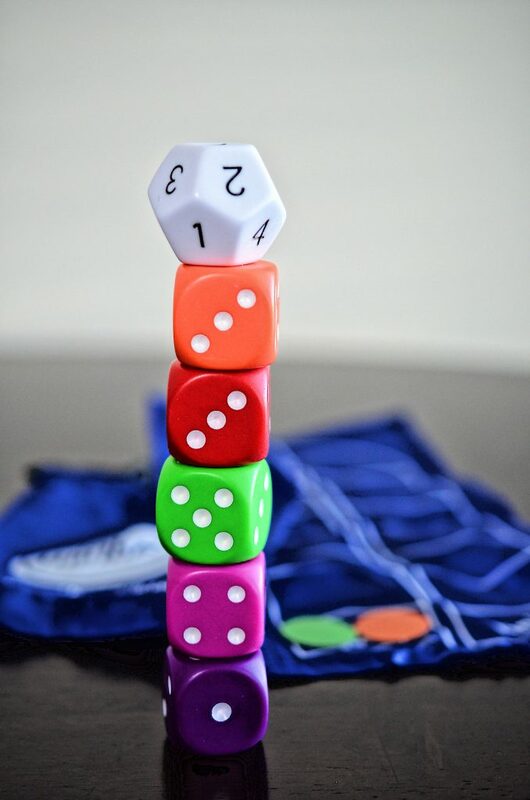 The round ends when all scoring dice have been claimed or when no other player can achieve the target number using the remaining scoring dice. Players advance their game token along the scoring track, moving one square for each point. In this example the player earned 2 points and can move the game token two spaces. The player that reaches the finish line first wins. Players with more advanced math skills should use the “Long Game Finish Line” which is 15 spaces from the start line (The normal finish line is only 7 spaces from the start line). This is a fun STEM game that allows children of all ages and to learn and further develop math skills in a fun and competitive way.